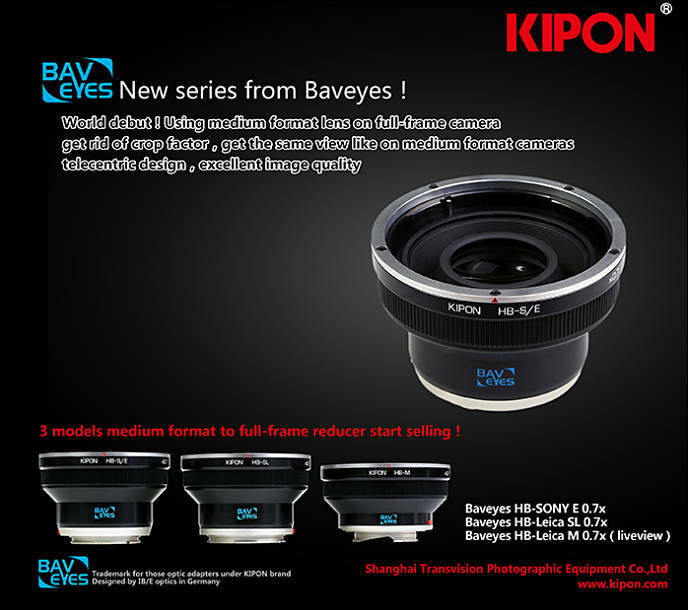 Kipon Baveyes introduces a series of three of the world's first lens adapters that bring the famous medium format Hasselblad V mount optics to Sony A7, Leica SL and Leica M 35mm full frame cameras, virtually eliminating any crop factor image loss and maintaining diagonal angle of view. Your favorite outstanding Carl Zeiss lenses, from wide angle to telephoto, ingeniously compress to a full-frame image, performing just like they were 35mm format full frame optics. The transformation results in a 0.7x factor to the original lens focal length with a gain of one stop in lens speed. 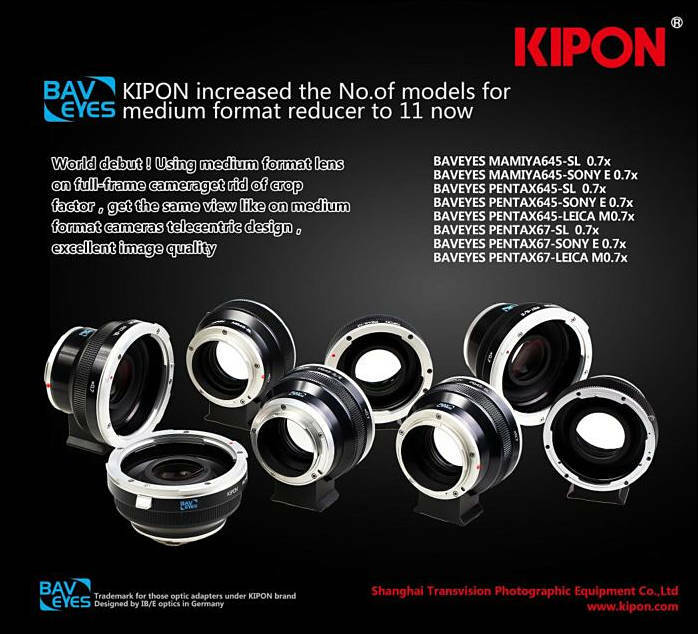 Foremost in the advanced adapters, is the custom designed five element multicoated formula by German optics research institution IB/E OPTICS, with the ability to use full frame SLR lenses on crop sensor camera bodies and mirrorless cameras. The Baveyes tele-centric formula is exclusively designed by IB/E Optics in Germany to only the utmost precision and quality. Hasselblad lenses by Carl Zeiss are legendary for contrast, flare resistance, color saturation, bokeh and are in a class of their own compared to even the best 35mm format glass. And the Sony and Leica image sensors, in the heart of their robust camera bodies, give new life to the Hasselblad/Zeiss heritage. So the Hasselblad 80mm f/2.8 becomes an enormous 56mm f/2? And the 50mm f/4 becomes a very large 35mm f/2.8? It seems better to just use smaller native full frame lenses. I'd be more excited for a tilt/shift adapter for MF lenses on E mount than a speed booster. Tilt shift adapters are small niche, I think. If you use APS-C camera you can use FF lenses with adapter. @eatstoomuchjam TS adapters already exist for E mount.